Youth Development, Healthy Living and Social Responsibility are the three focal points of all our work and while it’s easy to point to Y work and programs that deliver on the promise of healthy living and youth development, the notion of “social responsibility” can seem vague as literally everything we do is socially responsible. Helping people live healthier, more connected lives is socially responsible. Helping children and youth have every opportunity to succeed in school and in life is socially responsible. Yet our opportunity, if properly harnessed, is much bigger than that! That’s why I decided last year to create the position of Chief Social Responsibility Officer, which Michele Becote-Jackson so ably fills. With Social Responsibility as an intentional focus we now are able to create programs and opportunities for the communities we serve to participate actively in their own civic life and community building. This includes our heightened focus on volunteerism which, with Eric Somerville (Executive Director of Volunteerism and Community Engagement) fully dedicated to it, we now enable well over 6,000 people throughout central Maryland to fulfill that basic human need we all share to feel valued and a part of something bigger than ourselves. Our intentionality around Social Responsibility is still gaining traction and will continue to expand over the next few years. In the last ten days alone, we pulled off two terrific initiatives that underscore that fact. On September 25th, we were part of the biggest National Voter Registration Day ever, with over 800,000 people registered to vote across the country, when our very own volunteers and associates came together at eight of our Ys in the region to register people and help facilitate participation in the democratic process! Last Wednesday, we co-hosted, with the NAACP of Howard County, a debate for Howard County Executive at the Dancel Y in Ellicott City. More than 300 people attended this event, which fostered a lively and important discussion between the incumbent, Allan Kittleman, and his challenger, Calvin Ball, about the future of Howard County. I know that some people get concerned when we “wander” into the political realm, but what’s important to understand that we are not taking sides in elections or political debates. Our role is simply to facilitate civil discussion and civic engagement for our community. Participating in our democratic processes is an important part of helping to build and sustain healthy and vibrant communities. This debate between two good people was quite affirming to see and be a part of. It was exactly the kind of community convening we are committed to continue to keep doing. A picture is worth a thousand words. Please take a look at the photos and news stories from these two excellent events below. 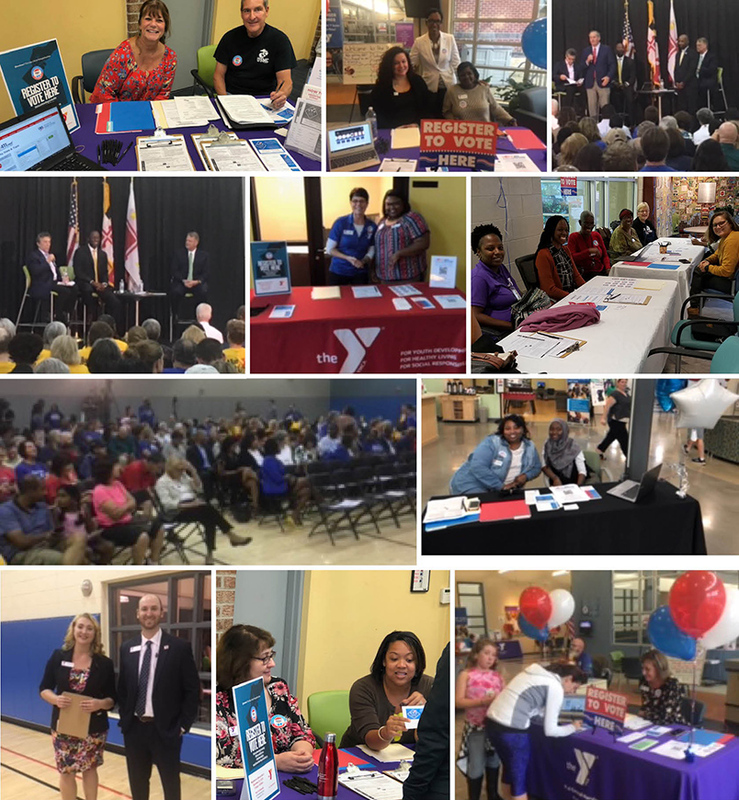 I want to extend my thanks to the teams of Y volunteers, associates and partners who helped make these events happen, including Michelle Becote-Jackson, Eric Somerville, the team at the Dancel Y in Ellicott City, the Marketing team, my friend Willie Flowers and the NAACP of Howard County, the League of Women Voters, and the many associates and volunteers across the region who rolled up their sleeves to demonstrate that at the Y in Central Maryland, the notion of “social responsibility” is more than a nice sounding phrase, it is indeed a deep commitment and solemn promise to facilitate a healthy and engaged community life for all. ©	2019	The Y in Central Maryland Blog. All Right Reserved.